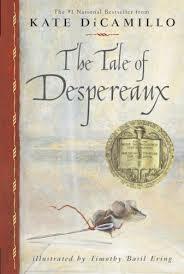 Despereaux sat and stared at him in dismay. What should he do now? He put a nervous paw up to his neck and pulled at the red thread, and suddenly his dream came flooding back to him…the dark and the light and the knight swinging his sword and the terrible moment when he had realized that the suit of armor was empty. And then, reader, as he stood before the king, a wonderful, amazing thought occurred to the mouse. What if the suit of armor had been empty for a reason? What if it had been empty because it was waiting? “You know me,” that was what the knight in his dream had said. “Yes,” said Despereaux out loud in wonder. “I do know you.”…. This entry was posted in Quotes and tagged Despereaux the Mouse, Kate DiCamillo, Knights in shining armor, Quotes, The Tale of Despereaux on August 27, 2014 by The Mithril Guardian.